The novelty of a rooftop solar mandate on new construction justifiably attracted a great deal of media coverage, with the cleantech trades picking it up first, and then rippling out to the national mainstream outlets as the CEC voted to approve. We read it all, so you don’t have to. 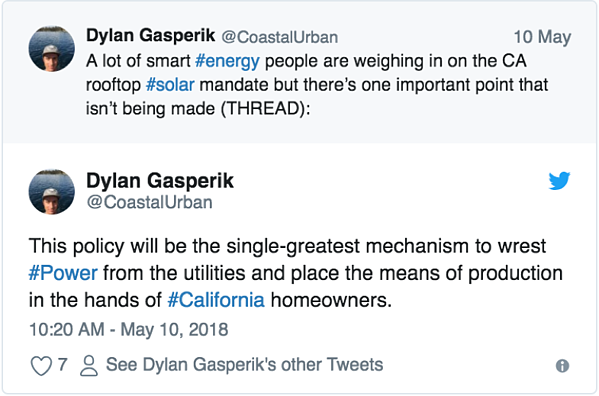 David Roberts summarized the arguments in favor and against the solar mandate for Vox, although in our view the headline of the article is misleading and not entirely supported by the body: California will require solar panels on all new homes. That’s not necessarily a good thing. Viewing this development from a marketing perspective, it occurs to us that this policy could open a new market of customers for solar equipment suppliers and installers who may have previously considered, but not pursued in earnest: home builders. How do you think the 2019 Building Energy Code will impact the grid and cleantech sector in California? Let us know on LinkedIn, Facebook or Twitter.